This beautiful, sturdy piece was built to last, but this price certainly will not, so don't hesitate, and if you somehow find it at a lower price, let us know and we will match it. 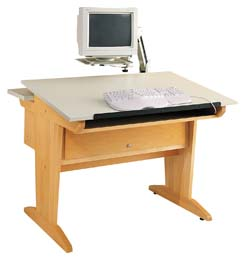 DIVERSIFIED WOODCRAFTS Art/CAD/Graphics Table w/extension arm This CAD and Graphics table is a perfect place for a creator to get lost in the zone. A launchpad for masterpieces is all about having a good personal space where you feel comfortable and inspired, look no further than this. Designed for a home PC, this piece was built with sturdy maple, and the legs are pedestal style, so you never have to worry about that annoying rocking back and forth of traditional desks. This piece also includes an extending arm, as well as a rear shelf and a storage cabinet, making it versatile, handy, and an all-in-one work area you can enjoy for years to come. It even includes back and front access for computer accessories and devices like a router, keyboard, mouse, and more. Find peace in your perfect space with this quality piece.